This weekend, step into the cozy ambience of Madras Café. Expect the unexpected as you are in for a thrilling adventure with Madras Café. 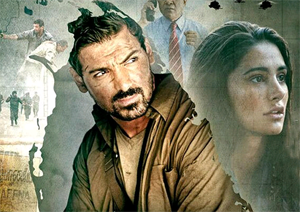 Starring John Abraham and Nargis Fakhri, Madras Cafe is a political thriller directed by niche director Shoojit Sircar. Riding on the success of Vicky Donor, Shoojit has taken up a new genre yet again. It is yet to be seen if he will replicate his success. His movies are refreshing, bold and entertaining at the same time. Let us see if Astrology and Numerology will favor him this time. All set to be released on 23rd August, Madras Café has already created quite a flutter due to its touchy subject. The movie uses the assassination of Indian Prime Minister Rajiv Gandhi as its backdrop. Interestingly, the plan to kill him was hatched at Madras Cafe. And though we all know what happened on the fateful day of the Prime Minister’s assassination, yet it would be very interesting and informative to go through the events all over again. Let us see if Shoojit Sircar manages to weave such a critical event and decisive junction of the recent history into a story worth watching. John Abraham plays an intelligence officer of RAW, while Nargis Fakhri is playing a war correspondent. Set in the early 1990s, the film deals with bloody history of Sri Lankan Civil war. One of the main reasons why the film is so sort after already is due to its controversial subject line. We do get to see oodles of love, action and comedy on screen; however subjects of this nature are seldom touched. Also it will be very interesting to watch John and Nargis together for the first time. India is a politically sensitive country with a large population, so nothing can go unnoticed here. This explains all the hype that the movie has managed to capture. The promos also look promising and we can expect entertainment of a different flavor after quite a long time. For many it will be an introduction to the recent political history surrounding India and its neighbor. The film is set to release on 23rd August 2013. Let’s see what Muhurat Shastra predicts about the commercial outcome of the film. -Tithi (lunar date) on 23rd August 2013 is Krishna-Trithiya. Tritiya is considered as Jaya tithi i.e. victorious day. -Moon will be passing through Uttara Bhadrapada Nakshatra on that day. It is recommended to start any work which is aimed to last long. The film will be remembered for a much longer period of time. -Yoga on that day will be Dhrithi, which is known to be very auspicious. -Karana Vanija is considered to be good to start commercial activity. Numerologically the name Madras cafe totals to 32. This is a fortunate number. It indicates success. It is considered a lucky number associated with combinations of people and nations. A suggestion from Numerology says that the producer of the movie should trust his judgment and do not let others influence him. The film seems to go well with the viewers and critics alike, provided the first show doesn’t start during Rahukalam i.e. 10.30 am to 12 noon. We hope that the makers of Madras Café have kept all the Astrological and Numerological aspects in mind to ensure that the film becomes a big time hit. Also, the brave attempt of the director deserves appreciation and applause. After analyzing various Numerological and Astrological aspects of the movie, we can say that it is going to be a successful film. People will line up to visit Madras Café and enjoy it too. Well, we hope to see action, thrill and of course John Abraham on big screen this weekend. Have a happy weekend at Madras Café! Ihope your forecast will be right wish you good luck.